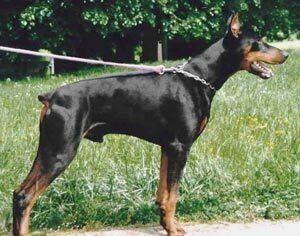 Chico von der Doberwache passed the ZTP with 1B rating for character and SG for conformation. His dam, Kleo von der Weyermühle, was a German Police dog who also won the working IDC World Championship in 1996 and his sire, Gero von der Mooreiche, was runner-up at the D.V. Meisterschaft in 1992 and 1996. Chico's sire lived to 12 years of age and his dam lived to almost 13 years of age. Ernst: IPO 3, DV-DM participant, IDC-WM participant and passed the Körung 'for life' with Körklasse 2B rating. Ehnoa: IPO 3, FH, DV-DM participant and passed the ZTP with 1A rating for character and SG for conformation. Enia: IPO 3, FH and passed the ZTP with 1A rating for character and SG for conformation. Esta: ÖPO 3 and passed the ZTP with 1A rating for character and SG for conformation. Falco: IPO 3, DV-DM participant, Landesmeister Westfalen in 2011.